Fashion Parade at the Canberra Hyatt Ballroom, Filipino Style! ​​The catwalk in the Federation Ballroom of the Canberra Hyatt, considered by many as Canberra's premier hotel, next to Capital Hill, was running hot on Monday evening 19th June, with national and international models showcasing the best of Philippine traditional and modern fashion made from Philippine handloomed textiles. There was even a textile loom demonstration in the foyer area next to the ballroom before the big event [photo above]. Dignitaries, such as Australian senators, embassy officials and their uniformed military attaches from around the world, high level Foreign Affairs and Trade officials, the Papal Ambassador to Australia, a senior executive official from Philippine Airlines and many other distinguished guests, were warmly welcomed near the entrance by a line up of the Philippine Ambassador to Australia, Minda Calaguian-Cruz and her husband, along with other senior officials of the Philippine Embassy. The lady models were stunning and the guys were gorgeous in their traditional clothing which they strutted in the Federation Ballroom as they wove their way with fashionable style down the catwalk. The crowd stayed entertained and enthralled throughout the fashion parade as the models showed a great variety of costumes unique to the Philippines. The parade brought together contemporary fashion design from the Philippines and traditional Filipino hand-loomed textiles, including piña, jusi, patadyong, polyabaca, abaca and hablon. The event showcased five of the Philippines' top contemporary designers, and included demonstrations of traditional hand-weaving looms. Photo above left: One of the international models close up on the Federation Ballroom catwalk. 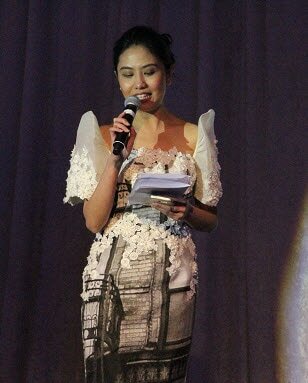 Photo above right: Philippine Embassy of Australia's own international looking model, Third Secretary and Vice Consul Nicole de Castro was Master of Ceremonies on the night and performed the task flawlessly. Photo below: Her Excellency, Ambassador Minda Calaguian-Cruz gives flowers to one of the international models as the top designers of the Philippines look on.